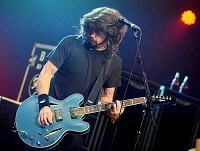 News - Adele toppled by Foo Fighters? Adele toppled by Foo Fighters? Adele's three-month reign at the top of the UK album chart is expected to end this weekend. The Official Chart Update predicts the singer will be knocked off her Number One spot by rockers the Foo Fighters and their new album Wasting Light. Dave Grohl's band are heading for Number One in this Sunday's Official Albums Chart and selling 50% faster than Adele's record-breaking 21. The latest Glee Cast album, Volume 5, is on course for third place in the chart, one place behind Adele. Adele's critically-acclaimed 11-track LP has already made pop history for the longest stay at the summit of the album chart. Her ballad Make You Feel My Love was at 39 at the weekend - enjoying its 53rd week in the top 40.